Based in Boston, MA, The Stirr Band is New England's Best Rock and Roll Dance / Show Band. The Stirr Band provides a Memorable Live Entertainment Experience to Music Lovers in MA NH VT ME RI CT NY and Just about anywhere else. The Stirr Band is available for Weddings, Parties, Functions, Nightclubs, Corporate Events, Benefit Concerts, and Fundraisers. By performing a wide selection of Your Favorite 50's to 00's Rock and Roll, Classic Rock, Pop, Country, and Dance Music, The Stirr Band will customize our show to suit any musical tastes or preferences. Based in Boston, MA, The Stirr Band is New England's Best Live Rock and Roll Dance / Show Band. The Stirr Band provides a Memorable Live Entertainment Experience to Music Lovers in MA NH VT ME RI CT NY and Just about anywhere else. The Stirr Band is available for Weddings, Parties, Functions, Nightclubs, Corporate Events, Benefit Concerts, and Fundraisers. By performing a wide selection of Your Favorite 50's to 00's Rock and Roll, Classic Rock, Pop, Country, and Dance Music, The Stirr Band will customize our show to suit any musical tastes or preferences. Click HERE for more information !!!!! "THE STIRR BAND" will be appearing at "The Bolton Street Tavern"
in Marlboro, MA, on Saturday, October 19th 2013. The show starts at 8:45. Call The Stirr Band at (978)302-6648 for details. You will be automatically notified about our next public appearance. 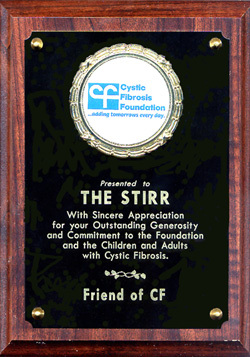 Call (978)302-6648 or visit "www.TheStirr.com" for more information. 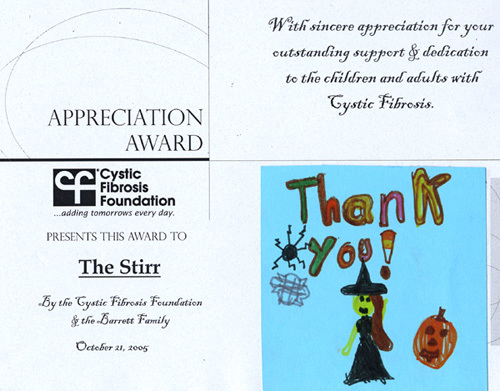 "The Cystic Fibrosis Foundation's SEARCH FOR A CURE". Cystic Fibrosis, The C.F. Foundation, and it's efforts to find a cure !!! Click Here to view a partial listing of our songs. Are you looking for a Photographer, or a Caterer for your event ?? Click here to contact A.A.D. The Stirr Entertainment provides top quality Live Entertainment within your budget. We provide Live band, Live Disk Jockey, Event Management, Live Sound, Live Sound Recording, Videography, and Consulting Services. Contact Us Today, and Relax Tonight, knowing your event is in good hands. Let The Stirr Entertainment help you with all of your live event needs.